We live in a world that is so full of the 'me' attitude that it really makes my heart hurt! More often than not we will see someone completely ignore basic kindness that it is appalling! Honestly, I think it takes more effort to be...less than kind than it does to show a little kindness! We also live in a world where people tend to dwell on the negative more often than the positive. How did that happen? God has created this great big universe and it is beautiful. I think this verse is a great reminder that there is more in the world than all the negative. There are things that are true in this world. There is honesty in some people. There are things that are just, even when it seems like the justice system is biased. There is a certain amount of purity in today's world! There are things that are lovely. Not everything in this world is ugly and blah! There are good things...I love the occasional...yes, occasional...stories that I will read of someone who has helped another person or has done something nice for someone else. There are things of virtue in today's world, albeit not necessarily seen without looking for them. It would be so easy to turn this negativity around...if each person would just purpose in their heart to do what this verse says. Today, I challenge you to put a stop to the negativity in your world...even if it's just for today...and follow this verse! Look for the truth; don't fall for the lies of the world. Look for honesty; be hones. Look for the just; treat others justly. 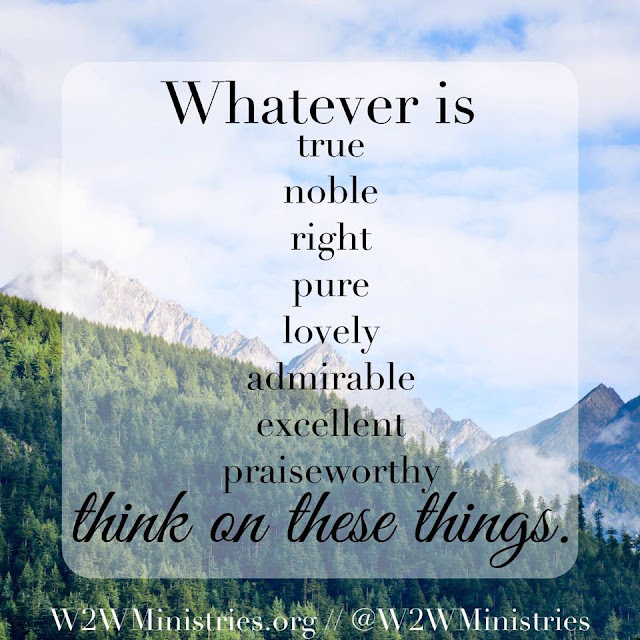 Look for the pure things of God; don't settle for the filth of this world. Cover your eyes and your heart; turn from those perverse things. Look for the lovely; every person and every thing in this world has something that is lovely about them/it. Look for the good; seek out good things and share them. Look for virtue; if you know someone who doesn't appear to have any virtue in them...look for a shred of it in them...it will be there when you look for it. And finally, praise! Praise God for the true, honest, just, pure, good reports, virtue...and praise God. God created beauty...man dirtied that beauty. And if man dirtied it, man can clean it up again!! Will you take the challenge today? Why not try it for just today; see how it goes. You may find that it is easier to see the bright and positive when you look for it! One f my favorite verses. When we are kind to one another we are fulfilling God's plan, to love our neighbor as ourself. What a wonderful reminder to be uplifting with our thoughts, deeds, and words to one another. Amen=Amein!! God Bless all my Sisters and Brothers in Christ Jesus-Yeshua and Your Family members and Friends!! I Love this Holy Bible Verse a lot!! Praise Jesus-Yeshua Christ for Today and Everyday, He is KING of kings and LORD of lords!! Hallelujah and Maranatha! !